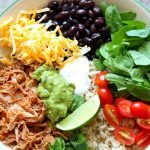 Perfectly tender and shreddable 5-ingredient pork is cooked quickly in your Instant Pot and then served with rice, guacamole, black beans, sour cream and more of your favorite toppings. Burrito bowl items: cilantro, lime wedges, romaine lettuce, tomatoes, pico de gallo, shredded cheese, black beans, brown rice, guacamole, sour cream, etc. Place pork in the bottom of your Instant Pot. Add in salsa, garlic powder, chili powder, cumin and broth. Cover with the lid. Make sure valve is set to “sealing.” Cook on high pressure. Press the manual button and set it to: 45 minutes for frozen pork country style ribs, 30 minutes for thawed pork country style ribs, 20 minutes for frozen boneless, skinless chicken thighs, 18 minutes for thawed boneless, skinless chicken thighs, 18 minutes for frozen chicken breasts, 15 minutes for thawed chicken breasts, 30 minutes for thawed beef chuck roast, quartered,60 minutes for frozen beef chuck roast (all in one piece). Remove the lid and shred the meat. Stir in the lime juice, if desired. Serve meat with desired burrito bowl items. *You can use pork, chicken or beef for this recipe. Note the difference in cooking times in the instructions. I used my Instant Pot Duo 60 7 in 1 for this recipe.